Allergy season is upon us. I have a simple herbal tonic that I make every year to help prevent and alleviate the misery of sneezing, itchy eyes, and so forth that plagues members of my family. Nettle Vinegar & Honey Allergy Tonic. Cover the jar with a lid and set it in a sunny spot for 2 weeks or more. Shake jar a few times a day. Once your nettle vinegar has infused, strain it through a coffee filter or piece of cheesecloth into a clean jar and it is ready to use. If you don’t have weeks to wait for the vinegar to infuse, you can make it more quickly by heating the vinegar/nettle mixture over a very, very low heat for a few hours. Do not boil or even simmer, just heat it enough to be quite warm, a double boiler is a good way to do this, or if your crockpot doesn’t get too hot (mine does even on low), use that. Let cool before straining. 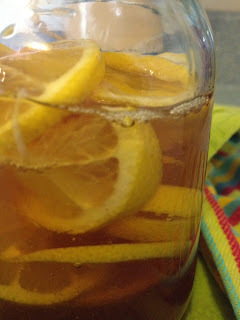 You can use the vinegar as is, or make it even more effective by adding local honey. Add an equal amount of local honey to the nettle vinegar, stir well, cover, and you have Nettle Vinegar and Honey Allergy Tonic! It is a simple herbal remedy that gives great results for my family. I take a tablespoon or so two or three times a day mixed in a small amount of water. A simpler route is to make a quart of nettle tea and sip on that throughout the day; but the honey and ACV are very helpful for allergies, and help with the taste. Nettle tea is not the most palatable of herbal infusions in my opinion. *Note: I have found that an infusion of 2 parts Tulsi (Holy Basil) and 1 part Nettle is tastier and also helps with the misery of allergy symptoms. Sweeten with local honey and it's even better! Nettle vinegar can also be used in salad dressings and most anywhere you would use apple cider vinegar. It makes a lovely hair rinse when diluted with water, too. More reasons to make up a large batch while you're at it! Note: As always with any herbal information, this is for your educational benefit only, etc., etc. ... Please consult your physician regarding any serious health matters. How do you treat allergies? Please share your own herbal remedies!